The building is listed as being of state significance on the Victorian Heritage Registry. The architectural practice of Seabrook and Fildes designed the Warracknabeal Town Hall. 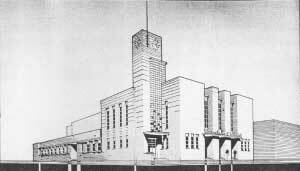 The practice is best known for Norman Seabrook’s competition-winning design for MacRobertson Girls’ High School (1933) in Albert Park, Melbourne. Completed with the assistance of Alan Fildes, this building marked a radical departure from previous public buildings in the state with its Dudok inspired composition of interlocking cream brick cubic forms with horizontally raked joints and red and blue detailing. Its functional zoned planning was new to school design in Australia along with its use of the steel detailing and modern fit out. The partnership of Seabrook and Fildes was made formal in 1936 after they had already completed designs for three industrial buildings in Brunswick, Carlton and West Melbourne. Following these, the practice designed a number of notable Modernist designs for banks, fire stations, industrial buildings, commercial buildings and residential designs. Unlike their peers who were mostly eclectic in their approach, Seabrook and Fildes were consistent in their use of a Modernist language, their buildings characterised by rectilinear cubic brick forms, functional planning and modern detailing. 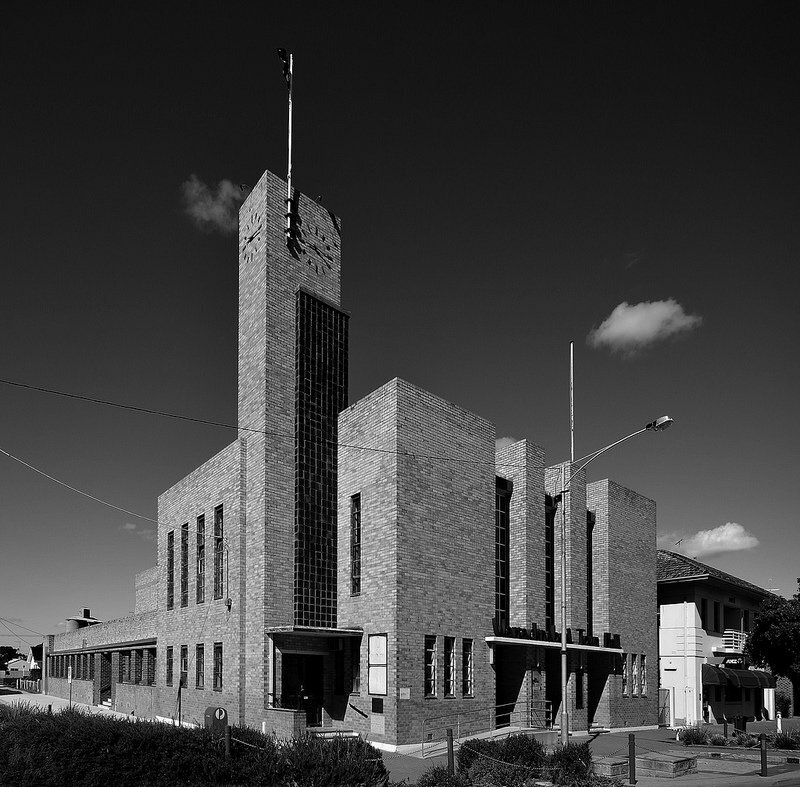 The practice’s design for the Warracknabeal Town Hall marked a significant departure from the classically inspired town halls that were prevalent around Australia and is an important example from the practice. No significant alterations made to date. The building is currently used for meetings and social functions. The council has relocated its business functions to a modern building. This building has in the past been in risk of demolition as a result of plans from the local Yarriambiack Council. The National Trust of Australia and editor of the Warracknabeal Herald along with local enthusiasts were, however, successful in convincing the council of the building’s valuable social and architectural merits. Funds were sought from various grant schemes to undergo repair and restoration works to the building that had been suffering from disrepair. The building has since been recently restored by (Robin) Barber’s Designs and is mostly in excellent condition. The works included restoration of the top balconies and council chambers, new paint throughout with new glazing and window repairs. When funds become available, there are also plans to upgrade the kitchen along with the auditorium stage that is currently in poor condition. The building is located in the commercial centre of Warracknabeal. Its facilities originally included an auditorium with stage that was used for both theatre and cinema facilities, council chambers, administrative offices, a baby health centre and amenities. The unusual inclusion of a cinema enabled ongoing revenue for the building costs and maintenance of the building. The building is composed of two bold brick volumes of face cream brickwork contrasted with the practice’s signature corner vertical clock tower with flagpole. The tower includes a projecting panel faced with brown tiles. The larger cubic form straddles the corner of Phillips and Scott Street. To its Scott Street façade, a thin concrete cantilevered canopy, characteristic of the practice, marks the entry and also props up the town hall’s name in modern sans serif lettering, another key device in the practice’s body of work. Above the canopy, three vertical windows that lit the former council chamber are set back from the face of the brickwork and stop short of the parapet, breaking the skyline as a striking play of negative and positive forms. Three narrow vertical windows frame both sides of the canopy on the ground level. A lower horizontal brick faced form faces onto Phillips Street and includes a series of vertical windows punctuated by brick piers to the lower level that lit the former supper room. These windows are framed at the top by a thin concrete cantilevered hood that emphasises the building’s horizontal form. A larger brick volume is set back from this with a blank façade. The interior is relatively simple and features stained plywood detailing with horizontal scoring. The building is located in Warracknabeal, a town in the heart of Victoria’s wheat-belt. Warracknabeal is situated along the Henty Highway and is around 330km north-west of Melbourne. The area was originally inhabited by the indigenous Wotjobaluk Nation prior to white settlement and the name Warracknabeal is derived from an aboriginal expression referring to the Redgum trees located by the watercourse. It currently has a population of around 2500. The building has been of great social significance for the town. Throughout its life, it has been home to many community gatherings and social gatherings including balls, films, parties, local theatre and community group meetings. The Warracknabeal Town Hall stands out as being one of the few Modernist town halls of the time in Victoria (and possibly Australia) where contemporary examples generally favoured classical styling. Whilst the Warracknabeal Town Hall is often compared with Wilem Dudok’s Hilversum Town Hall, its language is more specific to the practice of Seabrook and Fildes. Unlike Dudok’s example, it is not a series of interlocking forms but rather a bold cubic design that is a study of negative and solid forms. A similar earlier example can be seen at Leith and Bartlett in association with Peck and Kempter’s Heidelberg Town Hall (1937) that is also a rectilinear cream brick design. This earlier example, however, maintains classical detailing with its quoining and traditional window compositions. The building reflects a particular period in Australia’s history of civic architecture. The building is an important example of Australian Modernist architecture within the public realm. As one of the first Modernist town hall buildings constructed in Australia, it reflects a move away from the classical idiom in favour of a functionalist approach that contributed to the changing face of civic architecture at the time. • Christine Phillips, ‘Planting the seeds of Modernism: The work of Seabrook and Fildes 1933-1950,’ Master of Architecture (by thesis) Faculty of architecture, Building and Planning. The University of Melbourne, 2007. ‘National Trust of Australia Classification Report: Warracknabeal Town Hall’. Warracknabeal Herald, Tuesday 21 June, 1938. Figure 1: Corner view of the building: Private collection C Phillips. Figure 2: Illustration of the building produced by the practice: ‘Current Architetural Works’, Royal Victorian Institute of Architects, June 1930, p.105. Figure 3: View of the Scott Street facade: Private collection C Phillips.